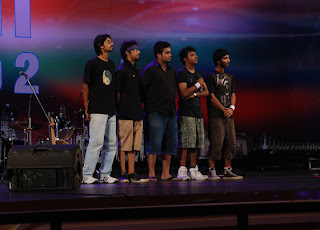 Kolkata’s Underground Authority Rock Band is the five members rock band from Kolkata that loves to try out A.R.Rahman’s songs in their own tunes. Underground Authority Rock Fusion Band that is famous in India’s Got Talent Khoj-2 Reality Show and that normally loves songs of A.R. Rahman to create exclusive remixes. Five College students, who love singing and mixing songs, from Kolkata formed Fusion Rock Band Underground Authority in early 2010. The Judges of India’s Got Talent Khoj-2 Reality TV show and especially Chulbul Pandey (Salman Khan) was thoroughly impressed with the performance of Underground Authority Band. Salman Khan already offered the lifetime achievement of Underground Authority Rock Band, Kolkata and that is the Fusion Rock Band Underground Authority will compose and remixes all the mp3 songs of Dabaang Hindi Movie of Salman Khan. The members of Underground Authority Rock Band are very energetic and performs exceptionally good foot-steps that Salman Khan really loved. Audition 2010 Kolkata, Lakh E Ak Bengali Reality Show Audition Registration Process Venue Date Schedule, Online Audition Registration of Reality Show on Television Channel. Timing for the Audition of Bengali TV Channel’s Reality show Lakh E Ak will start from 8am and the Registration Fees required of Rs. 500/-. Sree Krishna International Hotel, Dumdum Airport Gate No.1, Opposite of Radha Sree Cinema Hall. How to register online? For further details and to register online visit www.lakheak.com (Online Audition for Reality Shows).